Public transport (your guide will happily help you buy London transport cards, which will be useful for the rest of your trip! At 9:30am, your guide collects you from your central London hotel to begin your private walking tour. As you stroll past iconic attractions such as Big Ben, the Houses of Parliament, and the London Eye, your guide provides a historical overview of England’s capital city. Walk past the home of the British Prime Minister, 10 Downing Street, before absorbing the grandeur of Westminster Abbey, where Prince William married the Duchess of Cambridge. Then, pass Churchill’s War Rooms and take a turn around the verdant splendour of St. James’ Park on the way to catch a Changing of the Guard ceremony. 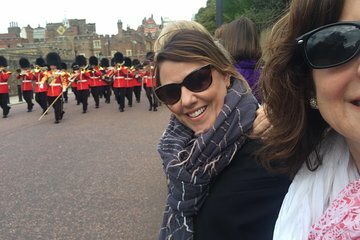 Many tourists make the mistake of viewing the ceremony amid crowds outside of Buckingham Palace, but your guide takes you to a prime vantage point. After snapping photographs outside of the Queen’s official residence, your guide takes you to a restaurant tailored to suit your culinary preferences. Here, you’ll bid your guide farewell and have the option to purchase lunch.